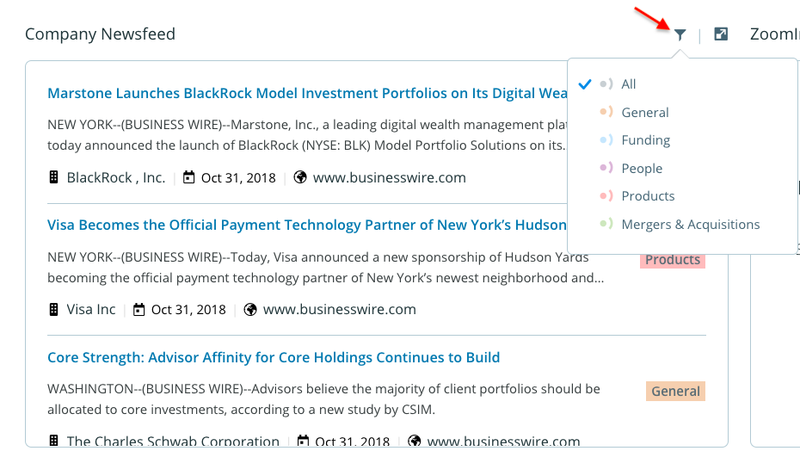 Our Homepage is designed to be a personalized dashboard to quickly view and access all of your recent activity, see ZoomInfo news, and set up your extensions within a few clicks. 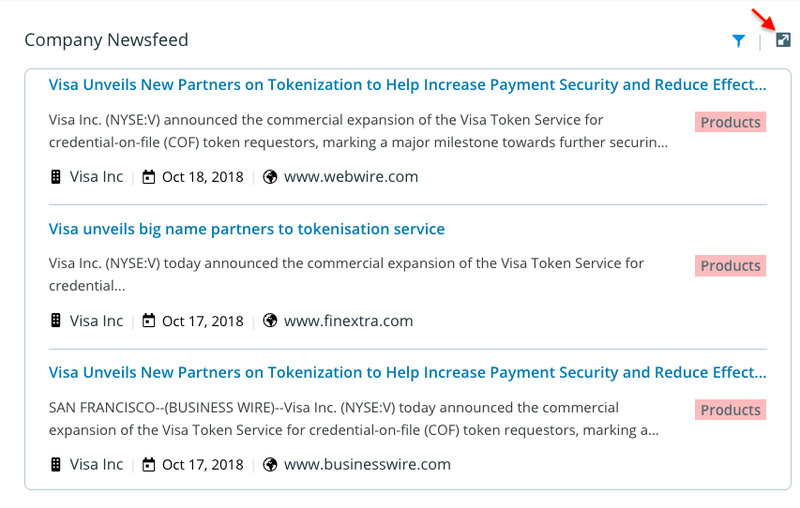 In this section, you'll be able to see the most recent web articles for companies that you subscribe to. 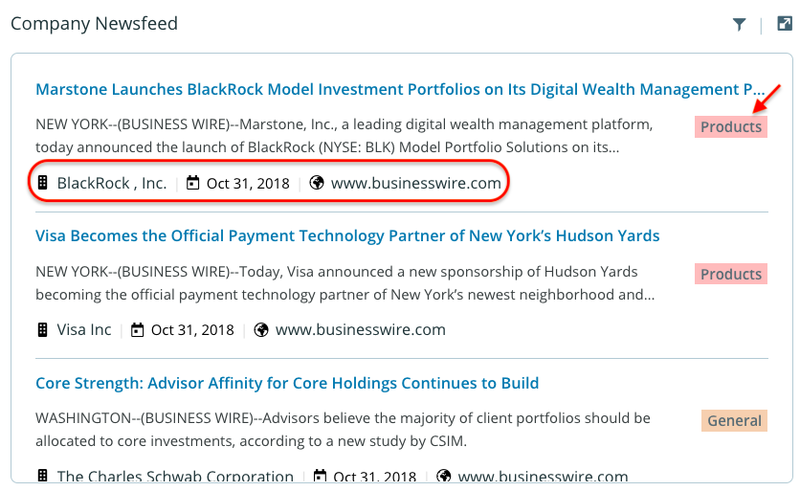 You'll see the company that the web article references, the date and website the article was published on, and the category that the article falls into. To go to the web article, simply click on the article name. To filter this newsfeed view based on the category, click on the filter icon in the top left and select the category. You can easily go to your full newsfeed by clicking on the arrow icon in the top right corner. In this section, you can quickly view and jump back into any Saved Searches, Recent Searches, or Recent Lists. Your full list of Saved Searches is scrollable using the blue arrow to the right. To access a saved search, simply click on the name of the search and Company/Contact Search will open with all of the saved filters applied. You'll be able to see when you conducted this search as well as the filters that were used. To access this search, simply click on the string of filters and Contact/Company Search will open with all of these filters applied. Easily view the most recent lists you've uploaded or are ready to be redeemed. To access a preview of the list, simply click on the list name. If you'd like to redeem the list click on the 'Redeem' button and confirm that you'd like to use data credits. Learn about what's new and exciting at ZoomInfo or sign up to be part of ZoomInfo's Advisory Board! ZoomInfo's Advisory Board gives users the ability to test new products and features before they're launched in order to provide critical feedback based on how users utilize our products. ReachOut Chrome Extension: If you haven't already downloaded the extension click on ReachOut to be taken to the Chrome Store to add to your Chrome browser. Not sure what this extension does? Visit our ReachOut Chrome Extension page to learn more! 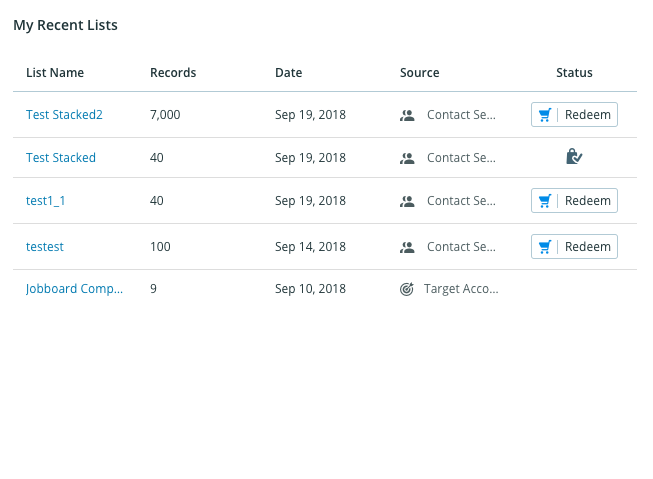 ZoomInfo Plugin for Salesforce: This will need to be set up by your organization's Salesforce Admin within your Salesforce environment. For more information visit our Installing & Configuring ZoomInfo Plugin for Salesforce page. Integrations: Easily see which integrations are connected and connect new integrations by clicking on the applicable icon. Visit our Setting up Integrations page for a step-by-step breakdown on how to connect each system to ZoomInfo. Our Data Management solutions (ZoomInfo Clean for Salesforce, ZoomInfo Complete for Salesforce, ZoomInfo Complete for Marketo) are additional products for purchase that will align with your Database Management strategies. For further information on these enrichment solutions, please reach out to your dedicated Account Manager!